Despite finding myself becoming more of a ‘boring’ person with each passing Christmas, but on the contrary I actually find my life becoming more exciting. This year’s Christmas has been very low-key one for me but an extremely meaningful one. First, I broke my personal record of giving away a total of 100 Christmas gifts to my list of family members, colleagues, church mates, friends and associates. Whether recession or not, God has blessed me much to be a blessing. I am thankful that I had enough to give as an expression of my sincere love to those around me especially my family. Second, I served my community. 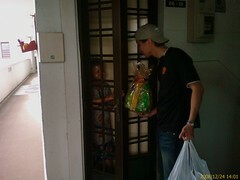 I took time to host a Christmas Party by my Resident’s Committee (RC) for the residents living in Clementi. I found it a great platform for me to use my talent, gifts and skills to serve my neighbours. On a separate occasion, I joined some of my fellow TOC members to distribute Christmas hampers and gifts to needy residents living at Old Airport Road. It was really satisfying to bless those families with no strings attached as we mentioned nothing of any organisation that we could have been representing. Personally, this sort of engagement through serving my community is humbling as it puts my life in His perspective with His love. Looking back, I am amazed how God has increased my ability and capacity to give as I walked in His ways over the years. I know I desire to give more and foresee that He will provide me the scalability or upward mobility in order to be a greater blessing. Though I no longer bask in parties with all the booze and glitter like how I used to enjoy, but I’ve now discovered the secret of attaining true joy; one that will not fade after the ‘high’ from the partying wears off. That ‘secret’ is through giving and serving those (regardless of religion, race, gender, age or background) around me. Been there & done that… distributed mooncakes as part of church outreach, xmas carolling among the aged sick, and gave out tracts,gifts & bibles during mission trips. So before i say “inspiring” let’s examine our heart conditions first. What is our motive for doing so? Is it purely 100% for Lord Jesus, or do we have other concurrent motives like peer acceptance, networking, career advancement or even democratic ideals? And anything that we cannot live without or give up is an idol/stumbling block in knowing Christ. Dun thank me, Thank our heavenly Father because HE wants You to be more like JESUS each day. Thanks for clarifying… By all means I welcome your comments. thank God for you, Andrew. I believe that in this materialistic society, some of the other Volunteers who may have signed up for other reasons, were inspired & humbled when they observed you working at it with no strings attached and with genuine enthusiasm and love. I pray that you will always love people and remember the Source and the Strength, who Was and Is and Is To Come. Thank God for you, again.